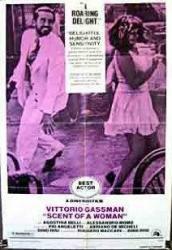 Drama/Comedy, Italy, 1974, 103 min. Synopsis An army cadet accompanies an irascible, blind captain on a week-long trip from Turin to Naples. The captain, Fausto, who wants no pity, brooks no disagreement, and charges into every situation, nicknames the youth Cuccio ("Babyfat"), and spends the next few days ordering him about and generally behaving badly in public. In Rome, Fausto summons a priest to ask for his blessing; in Naples, where Fausto joins a blind lieutenant for drinking and revelry, the two soldiers talk quietly and seriously about "going through with it." Also in Naples is Sara, in love with Fausto, but treated cruelly by him. What do the blind soldiers plan? Can Sara soften Fausto's hardened heart?